Anti-corruption activists who protested against Vladimir Putin’s fourth inauguration as president have seen their tweets, and in some cases their retweets of others’ publications, used by authorities as evidence of inciting mass disturbances. 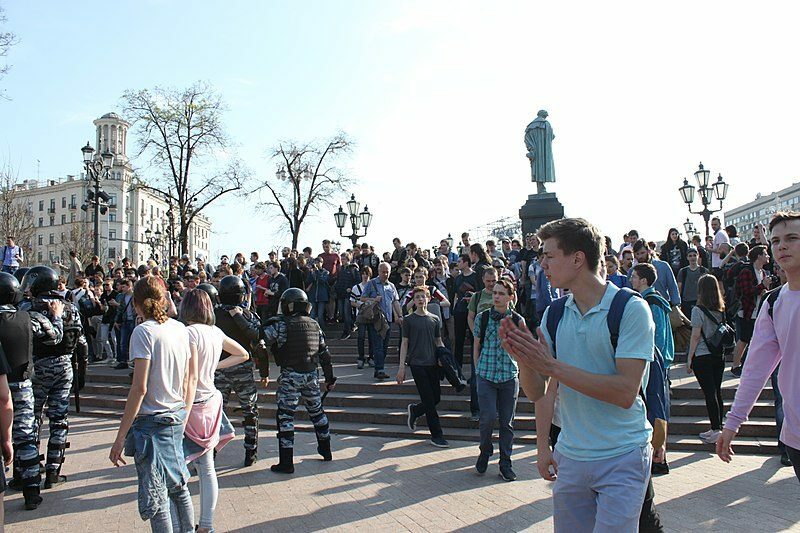 On May 5, the Anti-Corruption Foundation (FBK), Russia’s leading opposition organization, held a series of rallies across Russia under the common slogan “He’s not a tzar to us.” The demonstrations were met with violent resistance from both the police and loyalist groups. In Moscow, the rally on Pushkinskaya square was attacked by men in Cossack uniforms (whom the government often uses as paramilitary squads to harass the opposition while avoiding blame for direct police involvement,) as well as by regular and riot police. Dozens of people were injured, including at least 25 reporters, and more than 1,600 were detained. More arrests came after May 5. Over the next weeks, 28 FBK organizers and activists in total were taken into custody, charged with inciting riots based on their tweets or retweets, according to the organization's lawyer Ivan Zhdanov — who himself was arrested on May 24. While some were only fined and released, others were sentenced to the longest possible term for a misdemeanor under Russian law, 30 days. Ivan Zhdanov has just been detained outside our office. He’s facing the same article 20.2 [“Violating the established procedure for arranging or conducting a meeting, rally, demonstration, procession or picket” in the Russian administrative violations code] (but it’s his first time, so he’ll only get 10 days, not 30), so there goes another “organizing a rally by retweet.” Looks like this time they’re just locking up everyone. Elena Malakhovskaya, a news presenter on Navalny LIVE, FBK's YouTube channel, was arrested near her home for covering the May 5 protests on the channel — or “organizing an unsanctioned rally,” according to the police. News presenter @elmalakhovskaya has been detained near her home. Yarmysh’s tweet links to a YouTube video on Navalny’s channel promoting the May 5 rally. The video has accumulated over 3 million views at the time of writing. Another Navalny LIVE host, Ruslan Shavetdinov, was also jailed for 30 days based on his retweet of a similar message — although he was merely one of many thousands to do so. Human rights groups are saying this is part of a larger trend where more and more Russians are jailed for their online activity. Agora, a pro-bono law firm that offers legal assistance to defendants in such cases, says the number of prosecutions for posts and even reposts on social media in Russia is growing exponentially. According to their latest report, in 2017 a Russian internet user was sent to jail every eight days.